In nine years Acacia Quartet have won great respect for their versatile and inventive programs. Acacia have recorded six albums, with ‘Blue Silence’ earning a nomination for an APRA-AMCOS Art Music ‘Award for Excellence’. 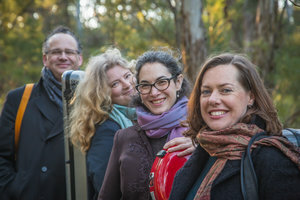 Acacia are passionate about supporting Australian composers, working with young musicians, and sharing their love of music with audiences of all ages. Their performances feature regularly on radio stations around the world. Acacia’s engagements in Australia include the Sydney Opera House, City Recital Hall Sydney, Melbourne Recital Hall, as well as extensive touring through regional NSW and Victoria. Acacia had their international debut in Vancouver, Canada at the Roundhouse in June 2016. The following year, Acacia Quartet were invited by the Christine Raphael Foundation to give their European debut, where they performed concerts in Berlin and recorded a CD with three string quartets by Günter Raphael, to be released in March 2019. Two further CDs have been released in 2018 in collaboration with recorder player Alicia Crossley and guitarist Matt Withers. Born in Sydney, Lisa began the violin aged 5 with Suzuki teachers Hiroko Primrose and Yasuki Nakamura. By 11 she was playing solos in Japan, the USA and New Zealand. Continuing studies with Christopher Kimber, Lisa won the Wenkart Competition, was finalist at the ABC Young Performers Competition and worked with the Australian Chamber Orchestra and Sydney Symphony Orchestra before going to Germany to study with Proof Igor Ozim. She has recorded French sonatas for the Klavins Music label and Bach concertos with Cologne Chamber Orchestra on the Naxos label. Lisa has also played as Guest 3rd Concertmaster with the London Philharmonic Orchestra under Bernard Haitink. Returning to Sydney in 2001, Lisa has been Guest Concertmaster of the Australian Opera and Ballet Orchestra, West Australian Symphony and Tasmanian Symphony Orchestras. Lisa is also a established illustrator with numerous published books through Scholastic Press, Random House, Hachette and HarperCollins. Born in Sydney, Myee began the violin aged 10 with Ernest Llewllyn. Further studies were with Alice Waten at the Hong Kong Academy for Performing Arts and David Takeno at the Guildhall School of Music in London. Whilst based in Europe, Myee was Concertmaster of the Jeunesses Musicales World Orchestra for two years, won 1st Prize at the Royal Overseas League Competition in London and held Principal positions with the Trondheim Symphony Orchestra, Norwegian Radio Orchestra and Arctimus Piano Quintet. Since returning to Australia in 2002, Myee has toured with the Australian Chamber Orchestra and Australian Brandenburg Orchestra, recorded regularly for ABC Classics, toured extensively with Acacia Quartet and since 2015 has become the Artistic Director of the Bowral Autumn Music Festival. Born in Oldenburg, Germany, Stefan studied viola with Marcel Charpentier, Konrad Grahe and Emile Cantor at the Folkwang University of the Arts in Essen and attended masterclasses with Thomas Brandis and Serge Collot. From 1992 he worked with a number of orchestras including the Cologne Chamber Orchestra, Theatre Nordhausen, Folkwang Chamber Orchestra, Philharmonia Hungarica, Philharmonie Essen, Düsseldorfer Sinfoniker and Die Deutsche Kammerphilharmonie Bremen. Since immigrating to Australia in 2001, Stefan has worked with the Australian Brandenburg Orchestra, the Australian Opera and Ballet Orchestra and recorded the 6th Brandenburg Concerto for ABC Classics. Since the formation of Acacia Quartet, Stefan has turned his focus to chamber music and teaching. Born in Vermont, USA, Anna moved to Salzburg, Austria at the age of 16, where she lived for the next 10 years. She completed a Bachelor of Music Performance at Mozarteum University Salzburg, studying cello with Astrid Sultz, Michael Tomasi and Heidi Litschauer. Whilst in Austria, Anna performed with the Salzburg Chamber Soloists, the Salzburg Cathedral Ensemble and at the Salzburg Festival with her quartet. Since moving to Sydney in 2008, Anna has played Principal Cello with the Sydney Philharmonia Orchestra and Pacific Opera and recorded for Vexations840, AFTRS, Sonar Music and a solo CD of Moya Henderson’s Ecstatic Exercises for Solo Cello. Anna now concentrates her energies on Acacia Quartet and her teaching at Cranbrook School and in Manly.